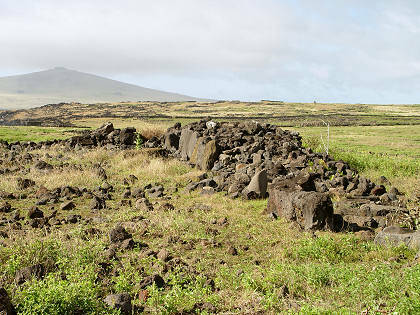 The huge fallen moai at Ahu Te Pito Kura. Without people in the picture it's hard to judge the size, but the moai is as long as a house. This is what an unrestored ahu looks like. At least this one is recognizably an ahu, others are no more than a quantity of rocks smeared across the landscape. A wave-worn rock arch, located at Punta Ure Mamo adjacent to Playa de Ovahe. I was going to revisit Rano Raraku to see a couple things I didn't see the other day, such as the moai inside the crater and "buttocks-man" (the only moai with buttocks). However, I decided I didn't want to start off with a long walk just to see a couple of things. I stopped at Ahu Tongariki by Hotu Iti cove and took a few snaps in the nice morning light. 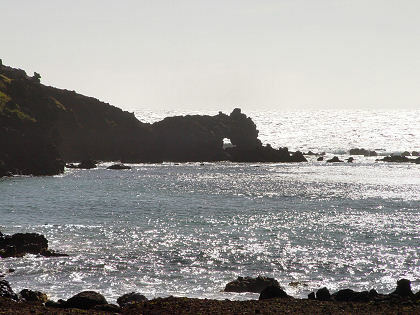 Then I headed off into new territory, driving across the Poike Peninsula to the north coast. Supposedly there was a defensive ditch here across the peninsula, but I didn't see it. Along the north coast I stopped at a few places to take pictures. 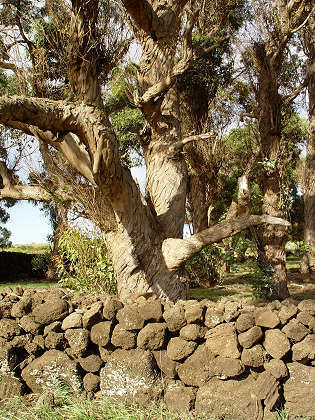 One such place was Ahu Te Pito Kura, which is supposed to have the biggest moai ever transported and erected. According to the guidebook the moai is 32 feet tall and weighs 82 tons, with a separate topknot that weighs 11.5 tons. Add those two weights together and the total is close to 100 tons, which for comparison's sake is about the weight of a jumbo jet or a diesel locomotive. The massive moai had been carved, transported, and erected by people using stone age tools and technology. So cleverness and industriousness are clearly not modern inventions. Unfortunately, at some point in its history the moai either fell down or was knocked down, and it broke into pieces when it landed. There were some Rapa Nui natives camped out nearby in a big ramshackle tent, and although we waved, I couldn't tell if theirs was a friendly wave so I didn't hang around. 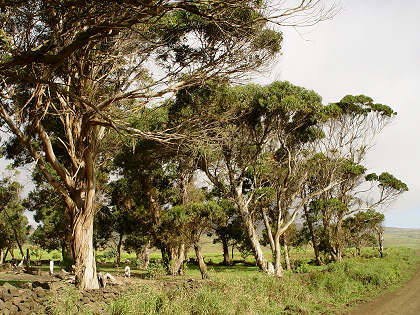 A grove of mature eucalyptus trees on the coast road between Ovahe and Anakena.